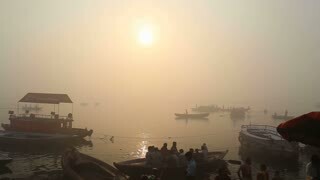 Man parking boat at foggy bay of river Ganges in Varanasi. 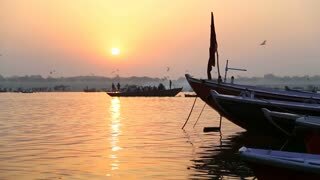 Boats on Ganges river in Varanasi at sunset. 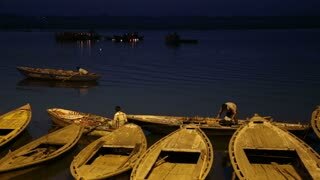 Sailors on boats in bay of Ganges river in night time. 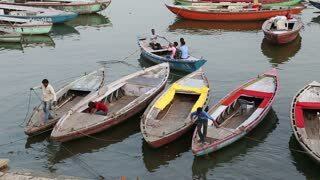 Men working on colorful boats in bay of Ganges river in Varanasi. 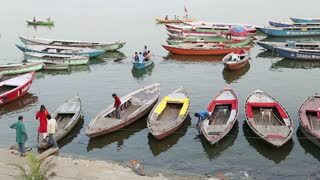 High angle view on boats anchored in bay of Ganges river in Varanasi. 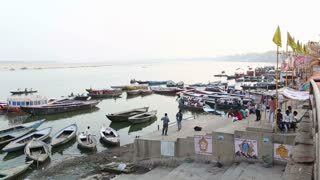 VARANASI, INDIA - 20 FEBRUARY 2015: High angle view of men on boats preparing to sail in bay of Ganges river. 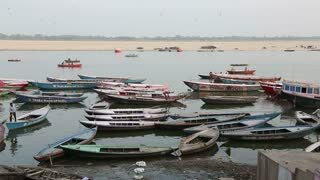 High angle view on anchored boats in bay of Ganges river in Varanasi. VARANASI, INDIA - 19 FEBRUARY 2015: Man praying at foggy dock of Ganges river while people pass by.